The new multi-national team from Southeast Asia is headed to the US Open, but their journey to get there goes beyond competition. When you peruse the US Open program, one team will stand out. Among American, Japanese, Colombian and other countries’ teams, you will find a one listed as “International.” Though they will hail from at least four countries, speak multiple languages, and will have only played two tournaments together, the Black Widows have found strength in their diversity and have the unified task of showing the world what Asian women can do on the ultimate field. Who are the Black Widows? How did they come to be? And why should you make an effort to watch them in Blaine? The Black Widow players confirmed for the US tour represent the Philippines, Malaysia, Singapore, and China (Hong Kong). These countries are spread across Southeast and East Asia. For reference, if Singapore and Malaysia were in Arizona, the Philippines would be in Wisconsin and Michigan’s Upper Peninsula, while the players from Hong Kong would come from north of Winnipeg. Europeans can substitute Spain, Poland, and Norway to get a sense of scale. The size of the countries in our region and of their ultimate-playing populations make international tournaments more common than strictly national events, and therefore international travel for tournaments is pretty standard for those who can afford it. So, when Filipina Rica Garcia and Singaporean Fiona Pang chatted in 2016 about women they would love to play with, their list was very international. It was this list that eventually became the core of the Black Widows. And they targeted Boon Rockstar Cup, in March of 2017, as the tournament where they would make their debut. Boon Rockstar Cup, held in the Philippines a couple hours north of Manila, had been actively promoting single gender play in Asia. Christina Lind-Hunter, a Malaysia-based player with roots in the Philippines and Hong Kong and experience with Great Britain’s national team, was added to the Black Widows’ leadership as a spirit captain. With Garcia as captain and Pang as field captain, the team’s leaders saw the visibility of Boon as a great opportunity to showcase Asia’s female stars. This encouraged them to search out players who were both high-level athletes and actively invested in growing the sport among women in Asia. These players filled out the Black Widows roster. At Boon Rockstar, the captains saw two potential obstacles to their success in the tournament. The first was the diversity of their team. How would it be possible to bring together players representing so many different cultures, religions, languages, and ultimate scenes? The captains attacked this problem straight on, but eventually realized that it was less of a problem than a strength of the team. They developed a team culture centered on S.H.I.I.T., an acronym for “Sisterhood, Humility, Intensity, Intimacy, and Trust.” They encouraged players to take pride in their identities and differences while simultaneously being part of a family. On the field, team discussions, instead of becoming a cacophony of disagreeing voices among a group made up mostly of captains of their home teams, were marked by listening, trust and a desire to learn. Off the field, their diversity, as opposed to dividing the team, brought them closer. This new international sisterhood created an environment where they got to hear new solutions and voices of support as they discussed real world issues, as well as a diverse group of wing-women for working the tournament party. 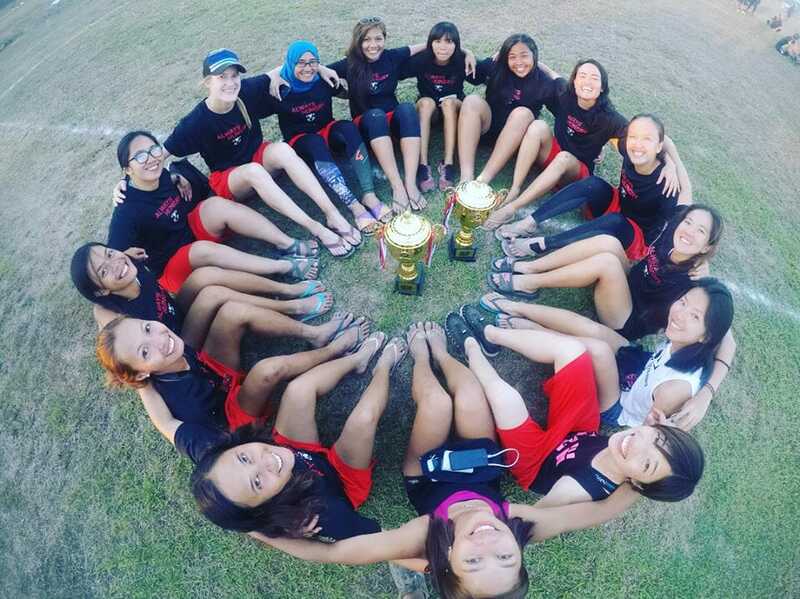 The second problem was that even though these were some of the top female players in Southeast Asia, very few had played women’s ultimate before. In this region, 90-95% of the tournaments are played mixed. Thus, these women, who were leaders of their hometown or country teams, had little experience fulfilling the roles usually given to men in mixed teams, such as hucking, cutting deep, and pulling. The captains realized that this was clearly a broader problem that they wanted to help work on in the region. In the meantime, their more experienced players picked up a majority of the “male” roles. The other players learned to become more rounded women’s players by improving one aspect of their game at a time. Another element of their inexperience playing women’s ultimate was that, even though many of the players were captains, they were used to yielding to male teammates and coaches. Having their players find their voices was seen an important part of forming team cohesion. During the team’s first “jersey night” on the Friday before Boon Rockstar, the players introduced themselves to their new team, in English. While they were all competent English speakers, many had never spoken in front of a group using the language before. These first moments of speaking in front of a group and being heard, listened to, and appreciated, were a major step towards forming the trust that has been central to Black Widow identity. The Black Widows won that first Boon Rockstar Cup. During the tournament and in its aftermath, things began to change. Black Widows were assembled to play just one tournament, but it was soon evident that there was more for the team to achieve. Players who had previously been hesitant to play on a women’s team saw how much they enjoyed it and how much they could learn. Their opponents and other members of the Asian ultimate community encouraged the Black Widows, a team made up of women who represented the diversity of the region and a team that looked like they could play with anyone in the world, to continue to play. And the captains realized that they had a message of diversity and pride that needed to be spread beyond just one tournament. The Black Widows must continue on. With Rockstar behind them, the Black Widows returned to their home countries. They actively communicated and continued to support each other both in their ultimate endeavors and with their off-field problems. Meanwhile, the leadership started planning their future. All of the encouragement they had received from throughout Asia pushed Garcia to find a bigger stage for Black Widows to perform on. So they applied to play on one of the biggest stages in the sport: the US Open. Expectations were very low as the application went in. The Black Widows weren’t affiliated with a national federation, had only played together once, were unlikely to be able to afford the trip, and only four international teams were going to be accepted in the women’s division. With the arrival of an invite letter, the Black Widow US tour became an unlikely reality. They entered Boon Rockstars 2018 as defending champions, but that was not the only way the second edition of the tournament for the Black Widows was different from the first. The other teams looked at them as heroes. In spirit circles, other teams pledged to raise money to help them. They were called an “inspiration.” The Black Widows leaders realized their new status as well. They presented opposing teams with postcards representing famous women in science and other fields, recognizing their common struggle. When it was clear that one their fallen opponents suffered from off-field issues, they stopped to help them work through those challenges. 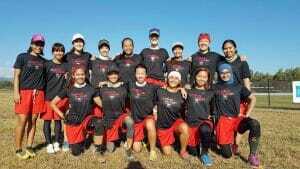 Black Widows lost in the semifinals to the eventual champions Lady Bandits from Boracay, Philippines. That defeat left them with an unexpected 3rd place finish, but you will hear no regret from the team. They took home the Spirit Award, of which they are very proud, and felt like a much improved team over the previous year. They believe that the loss has helped their mental toughness moving towards their US tour. The group of friends who had assembled the previous year for a one-off tournament experience were now ready to represent Asia. So what can you expect when you go check out a Black Widows game in Blaine? According to the captains, look for “intensity,” “athleticism,” “fast plays,” “huge hucks,” “quick breaks,” “speed,” and “talented handlers squeezing throws into small spaces.” Height will not be one of their strengths, according to the 4’10” Pang, though they have been working on ways to minimize the disadvantages through on-field strategies and off-field strength work. When asked which players fans should be looking for, the captains were in agreement: April Adalim, Jean “Khyrrah” Tuvilla, and Dijah Md. Isa. Adalim and Khyrrah represent two generations of Filipina ultimate. Discovered by the Boracay ultimate community when she was 14, Adalim has blossomed into a 19-year-old athletic phenom. Whether going vertically or horizontally, she is fast and fearless. Khyrra, from Davao, has improved in each of her 34 years and one captain suggested she might be the fastest player in Asia. Her experience and athleticism make her a player to watch. She is easy to find as she will likely be wearing her signature cat ear headband. And then there’s Dijah Md. Isa, “The Ninja.” She should also be noticeable because of her headwear, but she isn’t. She will be perhaps the first player to play at the US Open wearing a hijab. However, her unexpected speed and exceptional field intelligence has made her nearly invisible to defenders for years. She has a knack for eluding defenses and giving opposing coaches heart attacks. The women of Black Widows represent the diversity that Southeast Asia has to offer. They have the faces and bodies that we will recognize as fans from home watch at crazy late night hours. They will show us that the women of our region can play with anyone in the world. And they will do it while being simultaneously proud of where they come from and proud of the family they have become. You will have the opportunity to see the Black Widows play before the US Open in three not-to-be-missed showcase games: against Nemesis in Chicago on July 28, against Heist in Madison on July 29, and against Pop in Minneapolis on July 31. The Black Widows are very grateful to the companies that have already pledged to support their journey: Aria Ultimate, X-Gears, Friction Gloves, Discraft, UP Cleats, and E.R.I.C. This is a very expensive trip though, and many of the players are still unsure if they can make it happen financially. Please consider donating, or purchasing a really cool Black Widows fundraising disc, to help make this trip a reality. You can contribute directly or by buying a Aria Black Widows “Diversity in Women’s Ultimate” fundraising disc. Jared Cahners was captain of the University of Pennsylvania Void back when t-shirts counted as jerseys. He is now the president of the Cambodian Flying Disc Association and never shuts up about Cambodia’s women’s ultimate team. You can hear his soothing voice doing the live commentary for the final of AOUC 2015, AOUGCC 2017 and likely AOUC 2019. You can also catch some of his occasional musings at asianultimate.com or tweets at @asianulty. Comments on "Webs and Legs: Meet Southeast Asia’s Black Widows"